ABS is one of the biggest materials used to make plastic filament for 3D printing . It is a particularly robust and impact-resistant plastic that allows you to print durable and resistant parts for wear and tear. This type of plastic is very versatile and slightly flexible and can withstand temperatures up to about 85 ° C without deforming it. The prototypes created with ABS plastic filament are pleasing to the eye thanks to the ability of this material to be smoothed and painted. ABS plastic is a very popular thermopolymer due to its lightness and rigidity but also to the fact that it can be extruded or injection molded. It has good mechanical properties, is less friable than PLA and more supports higher temperatures. It is commonly used in all domestic, semi-professional and professional printers based on FDM technology, but also in industrial ones. 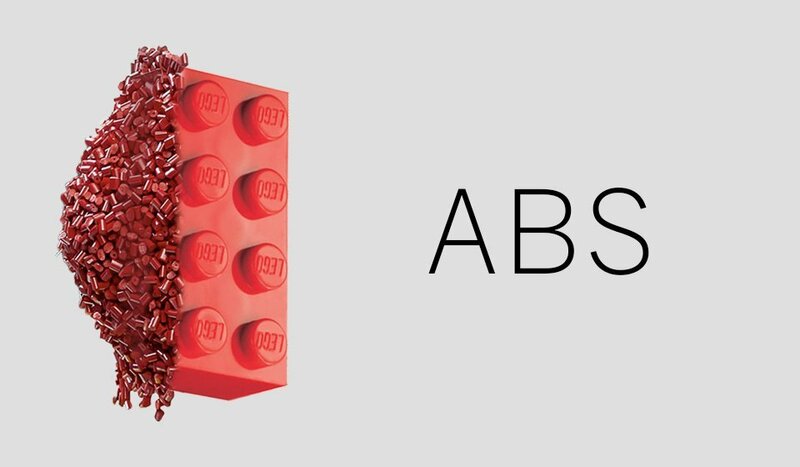 The objects built in ABS have the ability to preserve the original mechanical properties in a wide temperature range, they are not affected by humidity, they can be variously colored and even painted in post-production. The ABS plastic filament can be used in a temperature range between twenty degrees below zero and up to 80 degrees. It resists the action of concentrated acids such as hydrochloric and phosphoric, but undergoes attacks of concentrated sulfuric and nitric acids. Moreover, this material has a poor resistance to atmospheric agents (unless specific additives have been added to ABS), so it is not particularly suitable for applications exposed to the elements. ABS is a material that has a very low cost and furthermore its extreme resistance allows this material to be used for prototypes that must guarantee durability over time and rigidity. Compared to other materials it is a less crumbling material, it is subjected to generally higher temperatures and has a lower coefficient of friction, thanks to which the material is more easily extrudable. The use of this material has some cons: during the extrusion the ABS produces a pungent odor and it is recommended to work inside a ventilated environment. Lego bricks are made with ABS, many toys, protective helmets, car dashboards (and in some cases whole car bodies), control panels for household appliances, interior linings of refrigerators, suitcases, musical instruments such as flutes and clarinets, tubes blacks that carry water (white, orange or gray are PVC), boxes for electrical components and so on. The adhesion of the bed can be improved using an ABS suspension. You can make this dough by just mixing small pieces of ABS filament with acetone and applying the mixture on the printing bed. Subscribe to our newsletter for more 3D printing tips!